When used with the right MDM, great edtech has the power to transform learning in your district. In this JNUC 2017 Keynote, leaders from Pequea Valley School District explain how they use 1:1 iPads, eSpark Learning, and Jamf to provide students with engaging, effective mass customized learning. 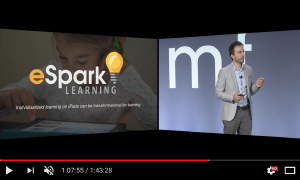 Watch this video to learn how to use eSpark and Jamf to make individualized instruction more engaging for students and more efficient for your staff. eSpark works with Jamf Pro to deliver on time app distribution to district networks.